It’s becoming harder and harder to come up with new ways to describe the greatness that is Sergio ‘Kun’ Aguero. 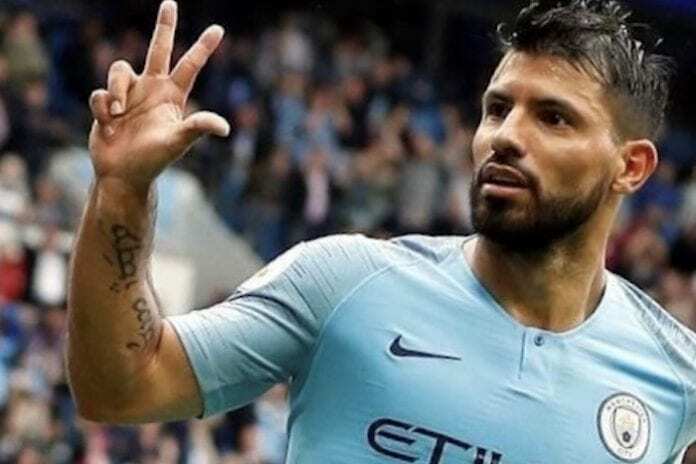 The Argentine forward, who became City’s all-time top goalscorer last season, kicked off this season by scoring goals number 200 and 201. He was at it again yesterday afternoon, bagging hat trick number 13. Aguero makes such a nuisance of himself in and around the box it drives defenders crazy. He has added so much to his already impressive game, tracking back and winning the ball back as well as scoring countless goals. Guardiola was full of praise for his star striker after the game. “Three goals a game is okay!” he laughed, when asked whether Aguero could become more clinical. We are not going to demand that. It wasn’t just Aguero who impressed on Sunday. The entire team played as if they hadn’t had a break and a World Cup since the final game of last season. The second game of the season saw the return of David Silva to the starting line-up and he produced a wonder display – and goal – in front of his son, Mateo. Silva has consistently been City’s best performer ever since he signed in 2012. His vision and creative genius is second to none and he fully deserved to put on such a display in front of his friends and family, given the events surrounding the birth of his son. “He made an outstanding performance,” Guardiola said. “It was his first game after the summertime. “He was so motivated. His family – his parents, his wife and his son – were here and he scored an amazing goal for him [Mateo]. “His son will never forget the first time he saw his father play football. “Last season was a tough moment for his family but, fortunately, the little boy fought a lot. On that front, we should be happy that we have the replacements already in place. Gabriel Jesus and Bernardo Silva have proven themselves to be more than capable. Jesus got on the score sheet himself on Sunday as he partnered Aguero up front. Bernardo very nearly did as well – but also impressed in pre-season and the games against Chelsea and Arsenal. Then look at the likes of young Phil Foden who looks every bit a senior player at the age of 18. City fans have every reason to be excited over what we can accomplish over the next few years.